Protecting your privacy is our top security concern. Virgin Wines Pty Ltd (ABN: 41 105 657 154) (Virgin Wines, we, us, our), whose registered office is Level 2, 407 Elizabeth Street, Surry Hills NSW 2010 Australia, is a member of the UK based Laithwaite&CloseCurlyQuote;s Wine Group global network. Virgin Wines, operating in Australia, is committed to protecting your privacy and we are bound by the Privacy Act 1988 (Cth), which sets out the Australian Privacy Principles (APPs) concerning the personal information privacy of individuals. Maintaining our records and to comply with our legal obligations. Personal information is any information about you, from which you can be identified. The types of personal information that we collect about you will depend on our relationship with you, the circumstances of collection and the type of products and service you request from us. Personal information we collect about you might include your name, date of birth, postal address, email address, telephone number and payment and order processing information. We may collect additional personal information from you from time to time. Where we can, we will collect this information directly from you. For example, when you contact us to make an enquiry, sign up for email offers, become a member, complete one of our forms, place an order to purchase from us, provide us with your details over the phone or otherwise use our services, purchase our products and provide us with information. As well as collecting information directly from you, there may be occasions when we may collect information about you from other people or organisations, including third parties that provide marketing leads, marketing and data analysis services to us, and from publicly available sources of information. We may combine this information with information we already have about you to help us understand trends, attributes, behaviour and preferences. Where we receive information about you indirectly from third parties, we require that the third party has collected and shared that information in accordance with the Privacy Act. We also collect general information about you when you use our websites. This might include your geo-location, IP address, the browser and operating system you are using, and details of websites that IP address has come from, the pages accessed on our website and the next website visited. You don&CloseCurlyQuote;t have to give us all the information we request. However, if you do not provide us with some or all of the personal information required, we may not be able to provide you with the products and services or information you request, to the requested standard or at all, and you may also miss out on receiving valuable information about us and our products and services. How do we use and disclose this information? Virgin Wines is part of the Laithwaite's Wine Group global network based in the UK and we may share information, including personal information, within our network companies due to shared infrastructures. We use a range of third party service providers to help us deliver our goods and services to you including customer support, web based marketing and sales, warehousing and fulfilment, mailing, courier and print services, IT, web hosting, data storage, payment processing, back-up and data analysis services. Some of our third party service providers may also be located overseas in various countries (including the United Kingdom and USA). We may be required by law to disclose certain information from time to time. As well we may from time to time share customer contact details with trustworthy third parties who will always be reputable companies that have interesting products and services they wish to promote to you. Virgin Wines may, from time to time, send direct marketing communications to you about us and our products and services, and other material that we consider you would find interesting or useful. If you do not wish to receive such direct marketing communications, you can always opt out. If you are receiving email communications from us, there will be a mechanism to opt out contained in each of those emails. To stop receiving other communications from us, you can contact us via any of the channels listed below. If you choose to opt out of all direct marketing communications, please note that Virgin Wines may still contact you for other reasonable purposes, including information that Virgin Wines is legally required to send, notifications of changes to Virgin Wines products and services or policies and information regarding the use, rights, benefits or obligations of customers of our products and services. Virgin Wines holds your personal information both electronically and in hard copy. Electronic data is stored on secure databases operated by third party service providers and some hard copy files are held at our secured offices. Virgin Wines takes the security of your personal information very seriously, and we implement a range of technical, administrative, personnel and physical measure to safeguard your personal information against loss, misuse, interference and unauthorised access, modification and disclosure. All information (including credit card details) is sent and received using the latest in secure e-commerce software. It is important to us that the information we hold about you is up-to-date, accurate and complete, and we will try to confirm your details through our communications with you and promptly add updated or new personal information to existing records when we are advised. If any of your details change, please notify us as soon as you can. If you believe we are holding information about you that is inaccurate, incomplete, irrelevant or misleading, you can ask us to correct it, or delete it altogether. If you would like to access your personal information, or request us to update, correct or delete it, you can do so by contacting us in writing and verifying your identity. We will do our best to respond to your request within 30 days. We will only refuse access in exceptional circumstances, and if this is the case, we will advise you of our reasons for doing so. We may charge a fee for searching for, and providing access to, your information on a per request basis. If you have a complaint about how we handle your personal information or you believe that Virgin Wines has breached the APPs or the IPPs, you can contact us in writing. We take your complaints seriously. We will attempt to resolve your issue quickly and fairly. If we cannot resolve your complaint to a satisfactory standard, you can lodge a complaint to the Office of the Australian Information Commissioner. Wine People Pty Ltd (ABN: 41 105 657 154) (Virgin Wines), whose registered office is Level 2, 407 Elizabeth Street, Surry Hills NSW 2010 is a member of the UK based Direct Wines Ltd. These Terms and Conditions apply to Laithwaite's Wine (collectively, Virgin Wines, we, us, our) in respect of each company's operations. Please read these Terms and Conditions carefully before purchasing products from us and print and keep a copy of them for your reference. We may change the content of the Sites from time to time, including the Terms and Conditions. By using the Sites (by whatever means or device) you agree that you have read, understood and accept these Terms and Conditions (as amended from time to time). If you do not agree to be bound by these Terms and Conditions, you may not place an order with us. The placing of an order anywhere on our Sites does not constitute a contract. Order acceptance and the contract between you and us will only be formed on the dispatch to you of the product(s) ordered unless we have notified you that we do not accept your order, or you have cancelled it in accordance with the instructions set out in the “Cancellations, Replacements and Refunds” section below. A contract is not formed at the point in time that payment has been taken from you by Virgin Wines nor at the point when you receive an email from Virgin Wines acknowledging receipt of your order. The repeated or fraudulent use of promo or coupon codes. All prices are quoted in Australian Dollars on Australian Sites and may be per bottle or per case, as marked. Unless indicated otherwise, the prices include GST. Any delivery charges are additional, unless otherwise specified. Virgin Wines accepts Visa, Mastercard, American Express and cheques. Although we endeavour to ensure that all pricing information on our Sites is accurate, occasionally an error may occur and products may be incorrectly priced. In the event that a product you have ordered is listed at an incorrect price we will contact you by telephone or email before dispatching your products asking you to confirm if you still wish to proceed with your order at the correct price or cancel your order. If you do not confirm that you wish to proceed with the order within seven days of the date of our email, we will consider this is a withdrawal of your order. Where a particular wine is part of a pre-mix case with a general discount applied, the discounted price for the case is relative to the non-discounted prices for the constituent wines. We reserve the right to alter prices and delivery charges without notice in the event of major currency fluctuations, changes in the rate of GST or other taxes, or other market conditions. We also reserve the right to terminate any special offer at any time, without notice. All products and services are subject to availability. Wine is an agricultural product and runs out from time to time. Occasionally we have to substitute wines for another vintage or an alternative wine of equal or greater value. If you are unhappy with any substitutions you receive we will arrange collection at our cost. We deliver to most addresses in Australia. For further details of the prices and timeframes for delivery please go to the Delivery page of our website. We reserve the right to restrict deliveries or to withdraw services to individual customers' addresses if you are repeatedly unavailable to take delivery of your order or in other exceptional circumstances. Our deliveries are made by third party carriers. If you are not at home when your delivery arrives and do not give specific delivery instructions, the delivery driver will leave a card indicating that they were unable to deliver your wine, with details on how to go about receiving your missed case. A reminder card will be sent to you after five days. Cases not collected within 14 days of the initial attempted delivery will be returned to us and a Virgin Wines Customer Service representative will contact you to arrange further delivery. You should keep your delivery note and all packaging and should notify us immediately if any of the order is missing or damaged. This clause applies to Virgin Wines’s Unlimited Membership (Unlimited Membership). By paying one flat annual membership fee, the Unlimited Membership gives you fast and unlimited delivery on all 12 or more bottle purchases (including wine plans) for 12 months, to up to 4 different delivery addresses. Membership is only available to customers aged 18 years or older and is not available for corporate customers. You must also have an account with Virgin Wines to sign up for and use our Unlimited Membership. Please note that the placing of an order for an Unlimited Membership does not constitute a contract. Your Unlimited Membership contract will only come into existence once we have written to you to confirm acceptance of your membership. This contract is between you and us. Nobody else has any rights under these Terms and Conditions or any rights to enforce these Terms and Conditions, and you may not transfer the rights, benefits or obligations under your Unlimited Membership to another person unless we agree to this in writing. At the end of each year of your Unlimited Membership, we will automatically renew your Unlimited Membership for another year. We will remind you of this before the expiry of your Unlimited Membership year and you can notify us at any time that you do not want such renewal to happen by contacting our Customer Services team using one of the methods in the “Contact Us” section below. Unless you notify us otherwise, you authorise us to collect the annual membership fee (as notified to you in our renewal reminder) from the credit card registered with your account on expiry of each membership year. you do anything which is illegal or harmful to our interests. If we terminate your Unlimited Membership for any of the above reasons, we will retain the price paid for your membership as compensation. We may also decide to not automatically renew your Unlimited Membership by giving you at least 1 month notice in writing prior to the end of your current membership year if we cease offering membership to our customers. We may make changes to the Unlimited Membership from time-to-time. If these affect you we will notify you in advance. This clause applies to Wine Plans. Wine Plans offer a convenient and regular delivery of wine. We will notify you of specific case details and when you can expect your credit card to be charged prior to each delivery. The credit card that you used to pay for the introductory case will be charged for all future Wine Plan cases. Your case will be delivered to the address we have on record for you and it's your responsibility to ensure that the contact details we hold on record for you (address and email address) are up-to-date. There is no obligation to take further cases - you can miss a case or cancel your Wine Plan at any time. If we don't hear from you by the date stated in our notification, we will dispatch a case to you and charge your credit card as agreed. If you have received a case and do not wish to retain it, you can cancel it in accordance with the instructions set out in the "Cancellations, Replacements and Refunds" section below. We may make changes to your Wine Plan from time-to-time. If these affect you we will notify you in advance. If you buy any of our wines and it is faulty or you don't like a bottle, please see our Quality Guarantee section below. If you change your mind about some or all of your order, you may also cancel your order up to and including 14 calendar days after the day on which you receive your order and we will arrange to collect (free of charge) the unwanted products and reimburse the appropriate sum paid including delivery costs within 14 calendar days after the day on which you tell us that you wish to cancel. However, if you handle the goods whilst they are in your possession in a way which would not be permitted in a shop (for example, by opening a bottle of wine or removing a seal), we will reduce your refund to reflect the reduction in the value of the goods. Please let us know if you wish to cancel an order by contacting our Customer Services team using one of the methods in the “Contact Us” section below. If you are e-mailing us or writing to us please include details of your order to help us identify it. All refunds given will be made by the same payment method you originally used to make payment. If a bottle of wine is corked, oxidised or appears otherwise out of condition, provided it is still within the recommended drink date and has been stored in suitable conditions, we will arrange to replace the faulty bottle with a bottle of the same type of wine (or if not available, a bottle of another type of wine which is of equivalent value). Alternatively if you prefer we will refund you an amount equal to the value of the bottle. We reserve the right to ask you to provide evidence of the fault and/or to collect the faulty bottle for inspection (at our cost). If, having opened a bottle, the wine was not to your taste, provided it is still within the recommended drink date and has been stored in suitable conditions, we will arrange to replace the bottle with a bottle of another type of wine which is of equivalent value. Alternatively, if you prefer we will refund you an amount equal to the value of the bottle. If you have any more unopened bottles of the same wine which you no longer want, we will arrange to collect them from you (free of charge) and replace them with bottles of another type of wine which are of equivalent value or if you prefer, give you a refund for an amount equivalent to their value. If you don't enjoy any of the wines or suspect that they may be faulty please contact our Customer Services team using one of the methods in the “Contact Us” section below and one of our wine advisers will be more than happy to assist. This Quality Guarantee is in addition to, and does not affect, your legal rights in respect of any of our products or services (for example, if any of our products are not of satisfactory quality). In particular, we are under a legal duty to supply goods that are in conformity with this contract. You have certain legal remedies if we breach these rights. To exercise your legal rights, please contact our Customer Services team using one of the methods in the “Contact Us” section below. All information (including credit card details) is sent and received using up-to-date secure e-commerce software. We continuously monitor and implement new security protocols and software as they become available. If you have any questions about any aspect of site security please contact our Customer Services team using one of the methods in the “Contact Us” section below. From time to time we may offer free delivery on selected products or purchase quantities. All such offers are governed by the advertised terms and conditions accompanying each offer. Unless otherwise stated, promotional (promo) or coupon codes are non-transferable, cannot be used in conjunction with another offer, may not be sold at auction and have no cash alternative. Promo or coupon codes are for single use only and may only be redeemed once per household and credit card. Terms and conditions accompanying the specific promo or coupon code may apply. Where a promo or coupon codes is used in breach of the above conditions we reserve the right to refuse to supply wines to you or to make a charge equivalent to the value of the promo or coupon codes against the payment card used on the contravening order or take steps to redeem the products as we deem appropriate. A charge may be made to cover the cost of recovery of the products. We reserve the right to terminate a promotion, cancel a promo or coupon code or alter its terms and conditions at any time without notice. You can earn Virgin Velocity Frequent Flyer Membership Points by shopping with Virgin Wines. To receive three Velocity Frequent Flyer Points per dollar spent, quote your Virgin Velocity Frequent Flyer Membership number when placing your order. You must be a Virgin Wines account holder and a Virgin Velocity Frequent Flyer member to earn points. Wines purchased from us are for the customer's own use only (which may include their use as gifts for third parties). Wines may not be re-sold or otherwise used for commercial purposes. It is against the law for any person under the age of 18 to buy, or attempt to buy alcohol or for any person over the age of 18 to buy or attempt to buy alcohol for any person under the age of 18. Virgin Wines is committed to upholding its legal and social obligations as a retailer of alcohol. By placing an order you confirm that you and the recipient of the wine are at least 18 years old. If our couriers are in doubt of the age of the recipient of an order they will request some form of ID. In the event that this is not satisfied they are not permitted to leave the wine. We will validate name, address, age and other personal information supplied by you during the order process against appropriate third party databases. By accepting these Terms and Conditions you consent to such checks being made. Personal information that you provide may be disclosed to a credit reference or fraud prevention agency which may keep a record of that information. This is done only to confirm your identity. A credit card check is not performed and your credit rating will be unaffected. If we cannot verify your age using this method we will contact you to ask for a driver licence number (or other evidence) in order to proceed with the order. For the purposes of the prevention or detection of offences, and/or the apprehension or prosecution of offenders, we may share any information that we collect with the police, other public or private sector agencies or representative bodies in accordance with the relevant legislation. Information shared in this way will not be used for marketing purposes. In these Terms and Conditions, Intellectual Property means statutory and other proprietary rights in respect of trademarks, patents, circuit layouts, copyright, confidential information and all other rights with respect to intellectual property as defined in Article 2 of the Convention establishing the World Intellectual Property Organisation of July 1967. All present and future copyright, design rights, unregistered designs, database rights, registered and unregistered trade marks and any other present and future Intellectual Property rights and rights in the nature of Intellectual Property rights existing in and to the Sites including content published on them such as text, graphics, logos, banners, images, buttons, underlying source code and software, are owned by us or the applicable licensor. Nothing in these Terms and Conditions shall be construed as an assignment to you of any such Intellectual Property rights. Any use (including copying, reproduction, duplication, transmission, or display of the content of the Sites, without our express written permission) for purposes other than the viewing of information or for ordering purposes, is strictly prohibited. Permission is granted to electronically copy, and to print in hard copy, portions of the Sites for the sole purpose of placing an order with us or using the Sites as a shopping resource. Alcohol should be consumed in moderation. A case of wine is heavy so extra care should be taken when lifting it. If you are concerned about the weight we advise that you transfer the bottles 1 or 2 at a time. Red wine in particular may cause staining if spilt so extra care should be taken. Sparkling wines and champagnes can be volatile due to the build-up of gasses. Extra care should be taken when opening these. The correct storage of wine is of vital importance. Where possible, you should store bottles horizontally, at a stable, cool temperature, out of direct light and in an atmosphere which has some moisture in order to avoid the drying out of corks. The wine should be subject to as little movement as possible. We have taken all reasonable care in the preparation of the content of our Sites. However, to the extent permitted by applicable law, we do not make any representations, warranties or terms of any kind in respect of the Sites or their contents (including, without limitation, its accuracy or any views or comments made). You warrant and represent that you have not relied on any term, undertaking, inducement or representation made by, or on behalf of, Virgin Wines which has not been expressly stated in these Terms and Conditions. Some jurisdictions do not allow the exclusion of certain warranties or conditions or the limitation or exclusion of liability for loss or damage caused by negligence, breach of contract or breach of implied terms, or incidental or consequential damages. Nothing in these Terms and Conditions excludes or limits Virgin Wines’s liability that may not be lawfully excluded or limited by applicable law. Accordingly, only the limitations that are lawful in your jurisdiction apply to you and Laithwaite's Wine People’s liability is limited to the maximum extent permitted by law. Virgin Wines excludes, to the maximum extent permitted by law, all (direct and indirect) or consequential liability that may arise as a result of the supply of specific goods and services under these Terms and Conditions arising under any theory of liability, including negligence. Your cause or contribution to the loss, damage or costs. in the case of services, the supplying of the services again (directly or indirectly) or the payment of the actual cost of having the services supplied again. Virgin Wines limits its aggregate liability under or in connection to the supply of specific goods and services under these Terms and Conditions to the GST exclusive aggregate price paid by you for the specific goods or services that gave rise to the liability. Our liability for any losses, damage or costs you suffer as a result of us failing to comply with these Terms and Conditions is strictly limited to any losses, damage or costs which are a foreseeable consequence of such failure. Loss, damage or a cost is foreseeable if either it is obvious that it will happen, or if, at the time the contract was made, both we and you knew it might happen. Virgin Wines is not responsible for any delay in, or failure of, performance of our obligations under these Terms and Conditions arising from any event which is outside of our control (for example, an act of God, governmental act, war, fire, adverse weather conditions including snow, flood or storm, explosion or civil commotion, failure of a third party (other than our sub-contractors) or in information technology or telecommunications services, or industrial action). In the event of a significant delay or failure, we will contact you and take reasonable steps to minimise the effect of the delay or failure. If you are unhappy with a delay which affects your order, you may cancel the order and receive a refund for any products you have paid for but not received by contacting us. If you subsequently receive your order after cancelling it and getting a refund, you must let us know and allow us to collect the products you have received. You must indemnify Virgin Wines against any claims, complaints or liabilities of any nature arising out of or in connection with your breach of these Terms and Conditions or any negligence, reckless or wilful act or omission by you or any person you are responsible for with respect to any non-compliance with laws and regulation or the violation of the rights of any third party. We may update or amend these Terms and Conditions from time to time to comply with law or to meet our changing business requirements by amending this page without notice to you. You are expected to check this page from time to time to take notice of any changes made. Such changes will be effective as soon as they are posted on the website. By continuing to use the Sites or purchasing products from us, you agree to be bound by the Terms and Conditions and any updates and amendments. These Terms and Conditions are governed by and construed in accordance with the laws of the State of New South Wales, Australia and the parties submit to the non-exclusive jurisdiction of the Courts of New South Wales, Australia. If any of these Terms and Conditions are found to be illegal, invalid or unenforceable by any court of competent jurisdiction, that part is taken to be deleted from the Terms and Conditions and will not affect enforceability of the remaining provisions. The failure or neglect by Virgin Wines to enforce any of its rights under these Terms and Conditions will not be deemed to be a waiver of those rights. We may freely transfer or assign any portion of our rights or delegate our obligations under these Terms and Conditions. You are not entitled to transfer or assign, by operation of law or otherwise, any portion of your rights or delegate you obligations under these Terms and Conditions without our prior written consent. The smart way to buy wine! ORDER NOW to receive 12 handcrafted wines plus 2 FREE Dartington Crystal stemless glasses (worth $40) for just $8.99 a bottle - delivered FREE! Sip succulent reds and mouthwatering whites from around the world, each one handcrafted by talented producers. For a limited time only we're offering you a special introductory case for $107.88, that's less than HALF PRICE! Plus, receive exclusive membership to our Discovery Club. It's totally flexible and gives you your very own personal Wine Advisor. You take the wines you want, when you want and are completely covered by our 100% money-back guarantee. Don't forget, you’ll receive 3 Velocity Points per every $1 spent on wine - how’s that for a deal? ORDER NOW to receive 12 handcrafted wines plus 2 FREE Dartington Crystal stemless glasses (worth $40) for just $107.88 - delivered FREE! Sip succulent reds and mouthwatering whites from around the world, each one handcrafted by talented producers. Simply choose the case you want (reds, whites or a mix) and we’ll include helpful tasting notes to enhance your wine experience... You pay just $8.99 a bottle! Best of all today’s delivery is on us! Get information on winemakers, grapes and regions – plus serving advice and food-matching tips. Click here to see the full tasting notes. You’ll receive 3 Velocity Points per every $1 spent on wine - how’s that for a deal? We select a Discovery Club case for you approximately every 12 weeks and at Christmas. Our best finds for the season. Wines for sunshine in summer and in winter the opposite. Common sense really. View Benefits enjoyed by members of The Club. You'll pay just $159.99 (plus shipping) Click here to see delivery charges. We'll give you a heads-up when your case is ready. Accept it, change the wines, delay delivery or skip altogether. It's up to you. If you take an all-reds introductory case, we'll reserve you future all-reds cases (and so on). Change your preference anytime. Hassle-free way to top up the wine rack. You chill. We do the work. If you don’t like any of our wines, you get a refund. True Story. This offer is only available for new customers. 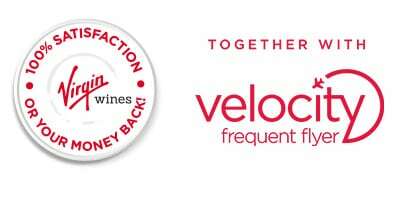 Don't forget, you get 3 Velocity Frequent Flyer Points for every $1 spent with Virgin Wines! Click 'Proceed to PayPal' below to complete your transaction on PayPal's site. We've auto-filled your MasterPass payment details. An error occured while processing your MasterPass request. Please retry. Your MasterPass Card has been saved to your account. To update, go to the Payment Methods section of My Wine Cellar. We accept Visa, MasterCard and American Express Cards. If you have any questions, please call us at 1300 712 870. The validation number for Visa, Mastercard and Discover Network is the 3-digit number printed on the back of your card, to the right of your signature. The American Express validation number is the 4-digit number printed on the front of your card, to the right of your card number. Save my details and create an online account now. By creating a password you'll be able to store your address and billing information for future orders. Plus, you'll be able to log in to see your order history, write reviews and more. If you prefer not to set up a user account, no problem, you can still enjoy all the great club benefits. Password should be a minimum of 8 characters and must contain at least 1 number. Yes, please email me with exclusive offers, special discounts, vouchers and order status updates. ENJOY 12 GREAT WINES, FREE DELIVERY & ALL THE BENEFITS OF THE DISCOVERY CLUB! We select a Discovery Club case for you approximately every 12 weeks and at Christmas. Our best finds for the season. Wines for sunshine in summer and in winter the opposite. Common sense really. You'll pay just $159.99 (plus shipping) Click here to see delivery charges. We'll give you a heads-up when your case is ready. Accept it, change the wines, delay delivery or skip altogether. It's up to you. If you take an all-reds introductory case, we'll reserve you future all-reds cases (and so on). To earn and redeem Velocity Points, you must be a Velocity Member. Velocity Membership Terms and Conditions apply. Just as you expected, terms and conditions apply: $120 savings and free delivery applies to introductory case only – worth $227.88, reduced to $107.88. One promotional case per household. Future Discovery Club case will be $159.99 (plus shipping). We select a Discovery Club case for you approximately every 12 weeks and at Christmas. The credit card that you use to pay for today’s introductory case will be charged for all future Discovery Club cases. Order acceptance and the contract between you and us will only be formed on the dispatch to you of the product(s) ordered. Orders will not be accepted (nor will wine be delivered to) persons under the age of 18 years. Retail prices are provided by wineries. All wines are covered by our guarantee - If you don’t like a wine, Virgin Wines will refund you and arrange collection. If a wine becomes unavailable, a similar wine of greater value may be supplied. Glasses stock is limited and if unavailable will be substituted with a bottle of wine. If you are unhappy with the substitute we’ll refund you. One promotional case per household. We do not deliver to parcel lockers, and unfortunately due to rising delivery costs and current liquor laws are unable to deliver to the Northern Territory. For full terms and conditions go to www.virginwines.com.au/terms or call us on 1300 712 870. (License No. 51400724, LIQP770016550) 200 Chalk Hill Rd, McLaren Vale SA 5171. Velocity Terms and Conditions: Velocity Members must provide their Velocity Membership Number at the time of purchase to earn Points. Velocity Points are earned on the cost of wine only (excluding shipping). Base Points will be credited to your account within 30 days. Velocity membership terms and conditios apply.